Convey your brand message with authentic and engaging content. Be real, then listen, learn and understand what makes your customers tick. 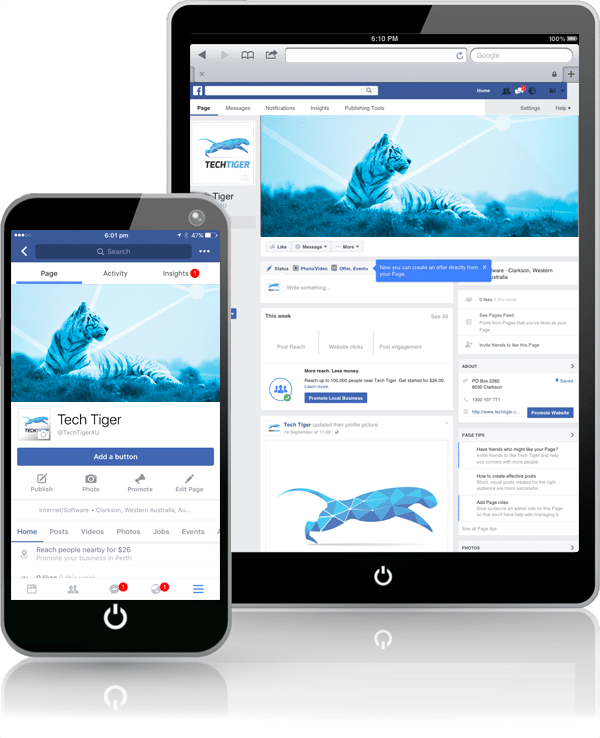 TECHTIGER loves Facebook for business. Find out how social media marketing Perth can work for you. Use Facebook Insights to view the efficiency of your campaign. Figure out what works based on user engagement; likes, comments and shares. Read what your clients have to say about your products and services, show you care. Ask for reviews to boost reputation and business. If it feels forced, then it probably is. Be authentic and be real. Engage your Facebook audience and immerse them in your brand to build loyalty. Facebook is the most popular social network worldwide boasting 1.71 billion monthly active users, of which 15 million are Australians. Social media is a two way channel, not a medium to say how good your business is. Use it as a feedback tool to promote conversation. Sponsor your most effective posts to appear in Facebook user newsfeeds. See sponsored and organic reach in Facebook insights. Facebook allows you to add a call-to-action button to your Facebook Page cover photo. This is a great way to drive traffic from Facebook back to your business website. Facebook offers the ability to “pin” one post to the top of your business page timeline. A pinned post is an ideal way to promote new lead generating offers, upcoming events, or important product announcements. Enabling messaging on your business page makes it easy for customers to reach out to you, but only do so if you have the time monitor and respond to your messages. The same can be said for monitoring comments and shares. It’s a good idea to ensure followers’ posts are seemly. As the owner of a Facebook business page, you are legally responsible for all of the content you post, as well as the content your followers contribute. Be sure that you have permission to post content if it isn’t yours. Ensure you’re not breaching copyright! Talk to TECHTIGER about how Facebook can work for your business and for social media marketing Perth. Hashtags are the secret source to Instagram success, and group your posts with similar content. This assists with capturing the attention of consumers and business owners with similar interests to you. Refer to the example on the right, with the correct hashtags, this post attracted a genuine SEO business lead for TechTiger. You can use up to 30 hashtags in an initial post and then 30 more hashtags in each subsequent comment. But don’t overdo it, use the Goldilocks principle. Instagram favours active users over those who are less active. Live videos and story posts help you get noticed by your followers and the general Instagram public. To maximise live video viewers, provide them with some warning days in advance and to prepare for your live video update. Talk to TECHTIGER about how Instagram can work for your business.